This post will keep you updated with the latest news, updates and downloads for Internet Explorer 11/10/9/8 in Windows 8/7/8.1/Vista/XP. 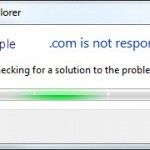 In any version of Windows, Internet Explorer would be installed by default and it’ll be the first ever web browser you would use to connect to the Internet in a freshly installed Windows. However, they may not be up to date if the Windows is not of the latest version. 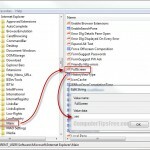 In Windows 8/7/8.1, Internet Explorer version supports up to IE 11. Windows Vista supports up to IE 9 while XP supports up to IE 8. Update: You can now download the latest version of IE in corresponding to your Windows version from this page provided by Microsoft. 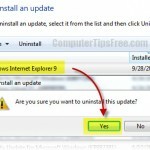 Your Windows version will be automatically detected and the most appropriate version of Internet Explorer will then be suggested to you. To open a new tab, just Double-Click an area to the right of the tabs boxes, without having to click the little blank Tab Box. Right-Click a blank area and click Favorites bar to enable the Favorites bar. Right-Click a blank area and click Command bar to enable the Command Bar. 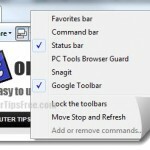 Right-Click a blank area and click Status Bar to enable the original style Status Bar at the bottom of IE11/IE10/IE9. Click the ALT key, and then click View on the Menu Bar, click Style and select No Style to View the Webpage without Webpage formatting. Click Default Style to change the Webpage back to default.